The C-Type was the first purpose-built racing car by Jaguar – although calling it a purpose-built racing car seems wrong, as these were entirely roadable as well. Jaguar did win Le Mans in 1951 with a C-Type (in its first attempt). It kind of set the tone for the next few decades of sports racing cars. Based around the XK120s mechanicals, the C-Type uses a tuned version of the XK120s 3.4-liter straight-six. Horsepower output was around 205. The chassis and frame were different – this car used a lightweight frame and a sleek aluminium body. 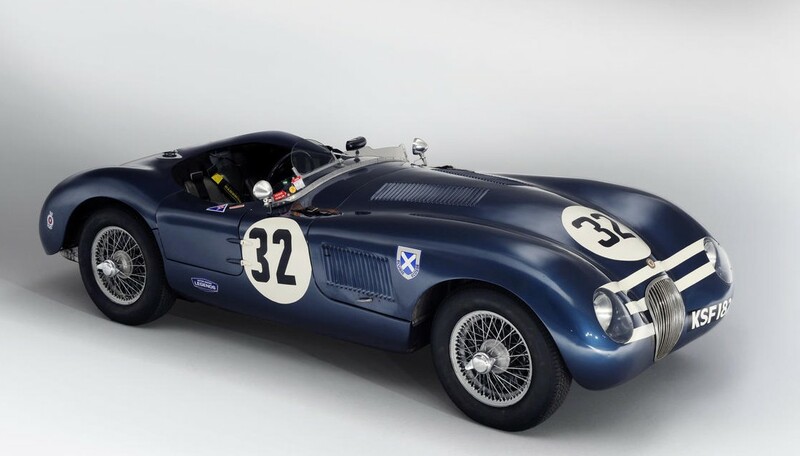 After the 1953 season, David Murray, the founder and head of Ecurie Ecosse, sold the Jaguar to a privateer, who raced it around Europe. The car bounced between owners (and countries) for decades before becoming the backbone of this incredible Ecurie Ecosse collection in 1992. It is being offered for sale by Bonhams, who call this (of all of the cars from this collection), the one that is “most pure” and “with the best provenance.” It can be yours for between $3,200,000-$4,800,000. Click here for more info and here for more from this sale. This entry was posted in Uncategorized and tagged 1952, auctions, Bonhams, c-type, cars, classic cars, jaguar, race cars, sports cars by classiccarweekly. Bookmark the permalink.